In February, Martin Sinyangwe, from north Malawi’s Chitipa District, was feeling abdominal pains, but he had idea why. Sinyangwe went to the local hospital where he was given some medicine, but his condition didn’t improve. After several unsuccessful visits to the hospital, Sinyangwe decided to visit a specialist private hospital after a non-governmental organization offered to cover his costs. It was then that doctors discovered a tumor, which required an operation. If he had relied on government hospitals, things might have turned out very differently. In a country where 50.7 percent of people live below the poverty line and 25 percent live in extreme poverty, according to the International Monetary Fund, it is evident that many people are facing the same problems. The few that can afford it either go abroad or to private hospitals to seek better medical care. But for the majority of Malawians, this is not an option; when they are sick, their options are limited and they are resigned to their fate. As a way of improving the health situation in the country, in January, China donated medicine and medical equipment worth MWK74.2 million ($102,000) to the country’s two referral hospitals of Kamuzu and Mzuzu. These included a bronchoscope (an instrument that allows a doctor to examine a patients airways) for Kamuzu Central Hospital and histopathology (the study of changes in tissues caused by disease) equipment for Mzuzu Central Hospital. Chinese Ambassador to Malawi Liu Hongyang acknowledged the cordial relationship between Malawian people and the Chinese Medical Team, which has been working in the country for the past decade. “When we talk about development, the Chinese Government always highlights people’s development in sectors such as healthcare, culture and education. This is because the development we advocate is toward building a strong community with a shared future for all humankind,” said Liu at the equipment handover ceremony in January. Apart from equipment, Liu also said that the Chinese Government has sent six groups of medical teams to Malawi in the past 11 years, made up of over 100 experts. These teams have treated 58,765 outpatients, 84,844 inpatients and conducted 22,368 operations in both Kamuzu Central Hospital and Mzuzu Central Hospital, according to Liu. 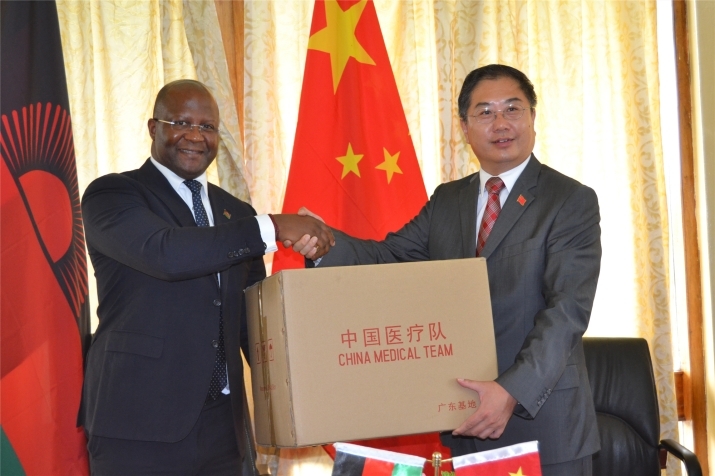 Malawi’s Minister of Health and Population Atupele Muluzi said China’s assistance is an indication that the diplomatic relationship between Malawi and China has developed quickly over the past 12 years since the establishment of diplomatic relations. He described China as Malawi’s true friend as it is committed to improving the health of Malawian people. However, the minister bemoaned the fact that despite its ambition to improve the health status of people in the country, the shortage of drugs and personnel is hampering matters. “The Malawian Government is committed to achieving universal health coverage to effectively care for all Malawians. To achieve this, we face a number of challenges that we have focused on in recent years. Some of these are the insufficient number of health workers, particularly specialist clinicians and key medical supplies,” said Muluzi. Muluzi disclosed that Malawi wants to establish centers of excellence in central hospitals by focusing on investment and reducing costs of duplication of facilities. According to the minister, government wants to establish intensive and critical care services, ear, nose and throat (ENT) services, cancer treatment services and orthopedics and pediatric services at Kamuzu Central Hospital. He said government is seeking to cooperate with China to train Malawi’s medical personnel on how to use donated equipment and in addition there must also be a clear understanding as to the chain of responsibility to care for this important equipment. “We are aware that new equipment sometimes requires specific training for both operators and technicians who maintained the equipment,” said Muluzi. He added that he had asked Malawi hospital directors to work with the China Medical Team to ensure that local medical personnel receive the training before the current term of China Medical Team departs at the end this year. To extend the team’s assistance programs in the country, the Malawian Government is negotiating to extend their stay for a longer period. The Chinese medical staff are not only restricted to providing services at the Kamuzu Central Hospital and Mzuzu Central Hospital, but also routinely travel to other areas of the country to offer free medical treatment. These visits are carried out twice a year into remote villages where no medical facilities exist. Apart from Chinese assistance, a number of local companies and organizations have tried to ease the situation, like media company Nation Publications Ltd., which has started an initiative called Mother’s Fun Run. The initiative seeks to curb and reduce unnecessary maternal deaths across Malawi by mobilizing resources through sponsoring outdoor events to help build maternity wings in public hospitals. Some of the equipment donated includes oxygen concentrators and stethoscopes. Apart from medical assistance, China has cooperated with Malawi in many major development projects. Some of them include the Karonga-Chitipa Road which has reduced time to travel between the two districts from four hours to one, and the Bingu International Conference Center and Presidential Villas. Malawi also has a Chinese-built parliament complex where legislators meet and a state-of-the-art sports stadium which hosts international games. He also said that although China has assisted Malawi in many ways, it has always looked at his country as a partner. In September last year, Mutharika went to China to attend the Beijing Summit of the Forum on China-Africa Corporation where he met Chinese President Xi Jinping at Great Hall of People in Beijing. President Xi said China will continue to help Malawi fast track its development agenda.